Do you consider yourself either an Athlete or an Active Person? If the answer is YES to either of these, then boy do we have something great in store for you! There’s a new SPORT in town—NeoLife SPORT. Every year people spend tons of money in hopes of getting stronger, and more fit — however, the only proper way to approach sports performance is with superior whole food nutrition that not only feeds your body what it needs during your workout, but also works as hard as your workout. Listen to this special call to hear the NeoLife SPORT panel from Convention 2016, moderated by NeoLife’s own Kendra Brassfield. A range of topics from the all new Performance Protein and it’s versatility, to the science behind the SPORT line are addressed by SAB Director, John Miller and SAB Member, Diane Clayton. Plus, hear from a former collegiate athlete and Major League Baseball scout about his first hand experience of NeoLife SPORT. But it doesn’t end there! As an added treat, NeoLife powered athlete, Lisa Blackburn shares her many years of experience and how NeoLife products have fueled her training and performance! 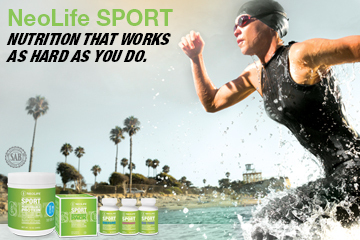 For more information on the new NeoLife SPORT Line and other products, please visit neolifeclub.com or call 800.432.5842. To learn how to build a foundation of good nutrition for you and your loved ones, visit ShareNeolife.com.